After a break in publishing, International scientific journal “Philological Sciences. 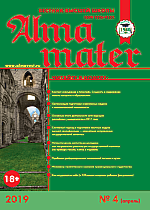 Scientific Essays of Higher Education” renewed it’s appearance since second half-year of 2013. The journal “Philological Sciences” was established by the Ministry of higher & secondary special education of the USSR in the year of 1958 to be in journalistic series of “Scientific Essays of Higher Education” (old ISSN 1024-1817). The journal published research results of both Russian and foreign scientists in the field of literary study & linguistics, reflecting topical questions of philological sciences, as well as most significant materials of scientific conferences, bibliographical surveys & reviews. In it’s renewed appearance, international scientific journal “Philological Sciences. Scientific Essays of Higher Education” intends to go on with informing of scientific community in modern condition of philological sciences & researches. Editorial staff of the journal offers scientists, researchers & readers, as well as all of interested persons to active participation in rebirth of legendary philological edition. It’s division in periods is three issues in a in six months. Founder & publisher of the journal “Philological Sciences. Scientific Essays of Higher Education” is Innovation scientific educational & publishing center ALMAVEST. Certificate of the journal’s registration as a means of mass communication is PI # FS77-53540, 10.04.2013, verifying by Federal Service of Public Control in the sphere of Communications, Information Technologies, and Mass Communications.